Panic and anxiety attacks are one of the most common physiological ailments experienced by Americans today. Panic attacks can come out of nowhere, so here's some tips to dealing with them in the moment. If you've had a panic attack before, you know how scary they can be. Your vision can blur, your hands shake, you can 't breath and you feel like you're dying. If you have panic attacks, don't worry, they're incredibly common and easy to treat. 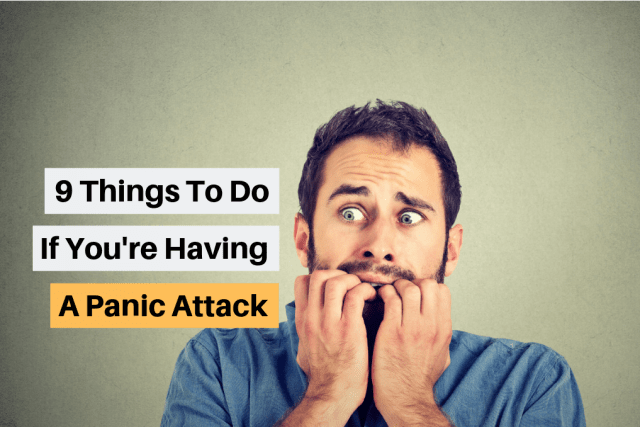 We'll show you some tips and tricks to ease a panic attack when it happens. 1. Use deep breathing - It's hard to focus on your breath during a panic attack but if you can remember to take deep breaths and keep breathing it will help curb the attack. 2. Remember that you're having a panic attack - When you're having a panic attack it's easy to think that it's something else, or worse, that you're dying. Keep telling yourself that it will pass and eventually it always does. 3. Close your eyes - When the attack comes on it can actually help to close your eyes, blocking any external stimuli from your senses. This calms your nervous system down and curbs the attack. 4. Practice mindfulness - Panic attacks can be very un-grounding. Ground your awareness in sensations you're familiar with like the sound of a plane going by or the feel of your hands on you jeans. 5. Find a focus object - It helps to find an object far away to focus on. Put all of your energy and focus on this one object and see if the panic subsides. 6. Use muscle relaxation - this is most useful for the early stages of a panic attack. Relax each muscle progressively until your entire body is loose and relaxed. 7. Picture your happy place - Visualize is great to get rid of panic. Picture yourself panicking in a serene meadow or what about a quiet, still church. Feeling panicked now? 8. Repeat a mantra - When you're panicking it's great to get your mind off of it by repeating mantra "This too shall pass." Panic attacks are temporary and usually only last 2-3 minutes so repeating this will remind you not to worry. 9. Take benzodiazepenes - When all else fails you can always take medication for you panic attacks. Benzodiazepenes treat panic attacks by sedating the nervous system. Keep them on hand if you have regular panic attacks. Now that you've learned how to curb that panic attack, do you feel less afraid of them?